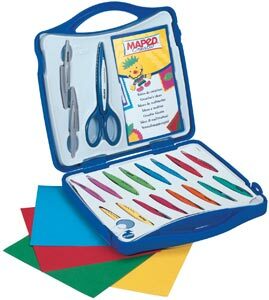 Contains one pair of scissors, ten sets of interchangeable blades, four sheets of colored paper and one booklet. For children and adults. Contains 1 pair of scissors and 10 sets of easily interchangeable blades in a protective case. Sleek and fun patterns are great for scrapbooking.